This is a guest review by Paul Havell, he blogs at I Remember Playing That! Check out our Write For Us page to find out how to contribute your own reviews. Each character has a weapon of the stick variety that increases in size with power ups. 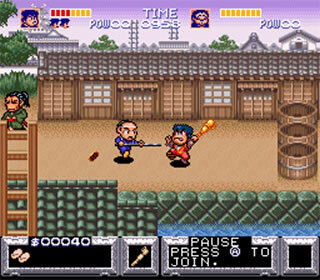 Legend of the Mystical Ninja is something of a significant title in the history of video game culture, despite it falling into the ‘obscure Japanese oddity’ category. You see, upon its release in Japan in 1991 (under the moniker Ganbare Goemon: Yukihime Kyuushutsu Emaki, no less), it was raved about endlessly by magazines like Super Play, who were enticed by its character, charm and sheer playability – but it was SO Japanese it would surely remain an expensive import. Well it took three years, but eventually Konami saw sense and it finally got its UK release – it went on to acquire a loyal fanbase and we’ve never looked back. Confidence from such games selling relatively well, meant companies were more open to releasing those obscure titles they originally thought too localised to see the light of day outside Japan – think Secret of Mana and Breath of Fire II on the SNES, and titles like Beautiful Katamri and Rhythm Paradise today. So, on the face of it, Goemon is a regular if quirky little platformer, but dig deep and you realise we have a lot to thank this little gem for. But even without its heroic status in my eyes, it would still stand up as an absolute classic. Here’s a challenge for you out there, download it on the Wii Virtual Console, start playing it and don’t smile. Go on, I dare you. If you manage it, I regret to inform you that your heart is made of pure stone. As from the very first scene to the last, Goemon is packed to the rafters with cute grin-inducing moments – you just want to pick it up and give it a big hug. 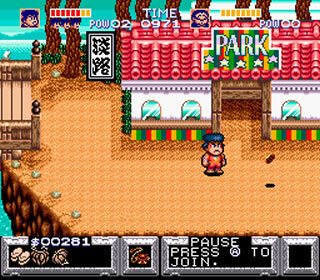 Goemon himself is animated superbly, with a portly frame and a mess of blue hair, and your pals, enemies and locations are all equally likeable. The gameplay itself is part platform, part RPG, part beat-em-up if there is such a thing. Waddling around the levels, smacking your enemies into oblivion is the main order of the day, but there are adventure-style elements to work out, and many a shop to enter and indulge in – one such shop has the whole first level of that other Konami classic Gradius to play! (I hate using the exclamation mark but seriously, if this doesn’t deserve one you may as well ban exclamation marks altogether). Japan-themed tunes bounce along merrily in the background, and the graphics are extremely vibrant – full of life and oriental charm. This game couldn’t be any more Japanese if it came doused in wasabi sauce and the cart came scented with cherry blossom. The Goemon series is still ticking over nicely. Based on a long-running anime series – it saw releases on the NES prior to Mystical Ninja and has spawned nearly 20 different games on various formats since. Yet none quite match the charm of this amazing little game (shown by the fact only one other title subsequently got a UK release – Mystical Ninja on the N64). Spend a few quid and track it down or download it – you won’t be disappointed. Oh, and if you failed the smile test earlier – play it two-player, climb on Goemon’s back and let him carry you round the level, whacking people carrying big fish. There you go, I knew you had a smile in you.